Shinto:Jyo-Jyo saku;Saijyo oo wazamono cutting test ranking:Settsu. Blade length :71.1cm or 28.0 inches. Width at the hamachi : 3.0cm or 1.18inches. 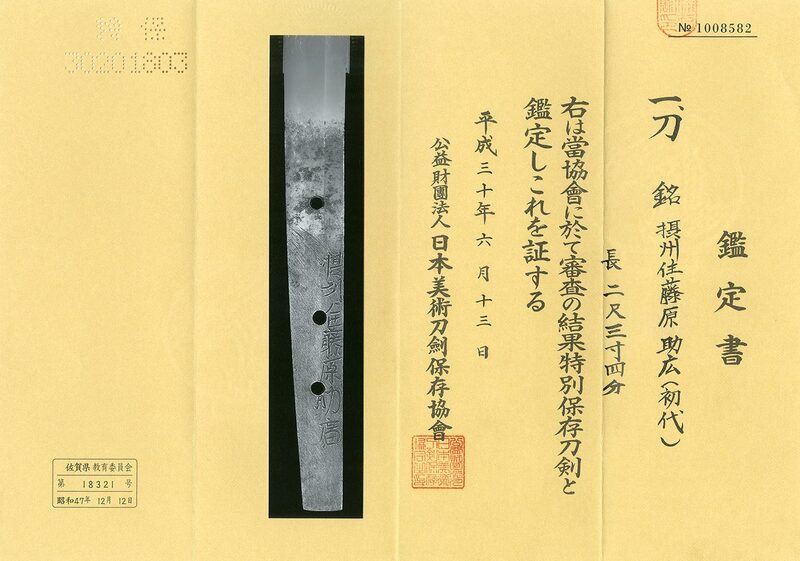 Width at the Kissaki : 1.57 cm or 0.62inches. Kasane :0.7 cm or 0.27 inches. Shape : The blade is abour 6cm suriage and Machiokuri with wide and thick with suitable sori and longer kissaki. Jigane :Koitame hada well grained with jinie attach beautiful nice oosaka jigane. Hamon :Konie deki cyoji midare with ashi, Yo and sunagashi ,small kinsuji scatter. Special feature: :Sessyu Jyu Fujiwara Sukehiro first generation was working at Settsu province and worked under the first generation Kawachi Kami Kunisuke. He was called Soboro sukehiro and made cyoji midare swords. Menuki : a big size tiger is engraved by copper plate. Fuchi:On the syakudo nanako plate, a dragon is engraved with gold color. From Aoi Art:It is hard to buy first generation Sukehiro. Generally he made sword with small size like 6ocm or longer or shorter size. It is few swords are left like this long size sword. The sword is jyo-Jyo saku and saijyo oowaza mono cutting test ranking high quality sword. The hamon is very active Ichimonji style or Tatara Cyoko style.